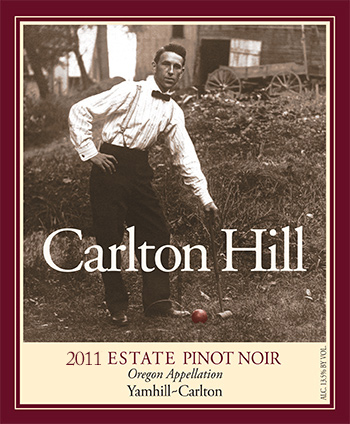 The 2011 Carlton Hill Estate Pinot Noir has been in bottle since October of 2012. Three years and some months later, I believe I can tell its story. If ever there was a wine and vintage which required faith and patience, this was it. Now I am pleased to report that a beautiful wine has emerged from very austere beginnings. Exotic earthy aromas blend with red berry and smoky spice on the nose. Flavors of raspberry, red current and pomegranate, lifted by a nice balance of tannin and acidy continue onto a broad, spicy finish. But now… for the rest of the story. Just when you thought it was safe to go outside again, Mother Nature had other things in store. As hard as this is to believe, farming in 2011 made the 2010 vintage feel like a walk in the park. Not only did we have to deal with angry birds again, but we somehow had to ripen a crop without the benefit of summer. 2011 turned out to be the coldest year on record here in Oregon. Bloom, something we can usually count on in early June, was not complete until the second week of July. I was heard to say on several occasions, to anyone who would listen, that 2011 would not be providing us a crop. Thankfully, I was wrong. In the end, it was all about good farming and canopy management. To get to proper ripeness, as much as 40% of the fruit was dropped on the ground due, in part, to an unusually large fruit set. Again, just one of the hurdles thrown up by this vintage. Thankfully, with a late season rally in the weather and, a lot of patience, we picked our first grapes on October 24th .Our older blocks were picked just two days before we went trick or treating. As for the wines, we reached 22 brix in the majority of our fermenters resulting in alcohol levels of approximately 12.3 %. All of our wine is the product of indigenous fermentations and, staying true to our philosophy of producing vintage driven Pinot Noirs, no chaptalization or concentrating was performed in the winery. The Estate Pinot Noir was aged in wood for 11 months, using approximately 20% new French oak barrels. Four clones contribute to the blend, the majority of which derives from our 115 and 777 blocks. While not identical, the wines from 2011 display characteristics similar to those found in the 2007 vintage which was also a cool, wet year. The story of the 2011 vintage continues to evolve. I believe this wine will only get better with time and, like its predecessors, is designed with food in mind.